Springboks Chiliboy Ralepelle and Bjorn Basson face possible drug bans after the South African Rugby Union confirmed they had returned positive 'B' samples. The duo were provisionally suspended and sent home from the Springboks' tour of Europe last month after they tested positive for banned substance methylhexaneamine following the 23-21 win over Ireland. The SARU confirmed that neither player would appeal the testing procedure after receiving notification that their 'B' samples matched the original findings. The SARU will therefore begin an investigation into the matter, with the governing body also set to convene a tribunal to hear the case at a date to be confirmed. 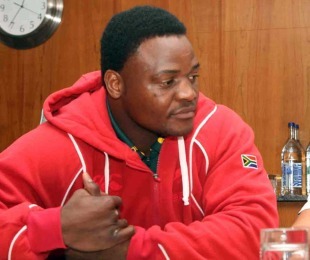 "The South African Rugby Union will appoint an Anti-Doping Tribunal to investigate an allegation of an anti-doping offence committed by Chiliboy Ralepelle and Bjorn Basson," an SARU statement read. "The players returned an adverse analytical finding for a prohibited stimulant, methylhexaneamine, following the match between South Africa and Ireland in Dublin on 6 November 2011. "Both players asked for their 'B' sample to be tested, which confirmed the findings of the 'A' sample. The players will not contest the testing procedures or related matters under the 2010 Autumn Internationals Anti-Doping Programme and therefore the investigation and hearing will be conducted in South Africa. "Investigations remain ongoing and a date for the hearing, as well as the composition of the tribunal, will be announced once those have been completed in the New Year." Ralepelle and Basson protested their innocence after the findings, saying they were "shocked and disappointed" by the results, which the Springboks had feared was caused by a nutritional supplement used by the entire team on tour. The world champions immediately scaled back their use of the supplements, which are set to come under review during the SARU investigation.